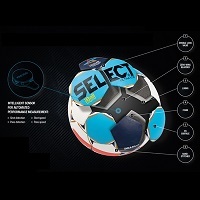 EHF partner and official ball supplier SELECT has once again proved that they are one of the leaders in the sports industry when it comes to innovative products. After winning ISPO ‘Product of the Year‘ Award for their resin-free Maxi Grip ball in 2018, SELECT once again underlined just why they are the leading ball supplier on the handball market. The company has been awarded with the ‘Product of the Year' Award for the iBall, the world’s first intelligent handball, which was introduced for the first time at the 2018 edition of the VELUX EHF FINAL4 in Cologne. ISPO awards honour the most exceptional sporting goods in five different categories. An independent international jury of experts chose the winners from among several hundreds entries. A selection of the award-winning products will be showcased from 3-6 February 2019 at ISPO Munich, the world’s largest international multi-segment exhibition in the sports industry. Based on the company’s ‘Ultimate’ top of the range match ball, which is used across all of the EHF’s club and national team competitions including the EHF Champions League and EHF EURO competitions, the iBall has a built-in chip tracks and distributes data in real time. Developed in partnership with German tracking company, KINEXON, the iBall is able to provide fans with a variety of real-time data such as shot speed, distance and position the shot was taken from and much more. This capability also offers brand new insights into the game to the fans watching in the arena or at home as all captured data is provided to TV stations and digital channels in real time. Following its premiere at the VELUX EHF FINAL4 2018 in Cologne, the iBall was also implemented during the final weekend of the Women’s EHF EURO in France in December 2018. The project, developed by the federation’s marketing arm, EHF Marketing, together with SELECT and KINEXON, aims to introduce new technology into handball and to raise the bar in overall coverage of EHF’s flagship events providing athletes, fans, media and sponsors with the opportunity to see the game from new and fascinating angles. Martin Hausleitner, EHF Secretary General, said: “The EHF’s partnership with SELECT not only offers the best possible playing conditions for players but is also helping us to further develop the sport through projects such as the development of the iBall tracking technology. David Szlezak, EHF Marketing Managing Director, said: “Introducing the iBall to the VELUX EHF FINAL4 2018 was an important step into handball’s digital future. Tracking technology has proven that it can create value for fans, media, coaches and athletes. KINEXON CEO, Maximilian Schmidt, said: “It is a great project with EHF and SELECT and we are really proud that the iBall wins this prestigious award. By partnering with SELECT, we provide an intelligent handball fulfilling the highest level of quality. SELECT CEO, Peter Knap, said: “We are very proud to receive the ISPO Product of the Year award second time around, and we believe that the SELECT Ultimate iBall will help to improve the framework for events and increase the visibility of top-level handball. Eigil Nielsen, star goalkeeper of the Danish national football team, founded SELECT in 1947. Through the years, SELECT became an innovator by producing the first laceless ball, the first ball with 32 panels and the introduction of synthetic leather. Most of the world’s handball tournaments are today still played with balls made by Eigil Nielsen’s principle of 32 panels. Just as most balls produced all over the world are based on his innovative thinking. SELECT sells more than 3.5 million balls a year as well as a large portfolio of sporting articles in 50 countries all over the world. KINEXON Sports & Media develops cutting-edge solutions for automated, real-time sports content. It brings athlete performance, media experience and entertainment formats to the next level. The portfolio includes both an unrivaled sensor technology for centimeter-accurate indoor and outdoor localization and motion sensing of professional athletes in various sports. Moreover, the portfolio includes software solutions for smart data processing and actionable insights through various analytics. The company was founded in 2012 by scientists of the Technical University Munich. KINEXON is located in Munich (headquarters), New York City and Chicago. EHF Marketing GmbH is the marketing arm and subsidiary of the European Handball Federation. The company works closely with marketing and media partners, as well as with Europe’s leading clubs to realise the full potential of the sport on the international sports market. EHF Marketing GmbH is responsible for the marketing and media rights of club competitions including the VELUX EHF Champions League, WOMEN’S EHF Champions League and the MEN’S EHF Cup.